The macula, which is located in the center of the eye, absorbs blue and ultraviolet lights that enter the eye. It also determines our ability to read, watch television, use a phone, and recognize faces. Macular degeneration affects more Americans than cataracts and glaucoma combined, which makes it the leading cause of vision loss. We all get older; it is a part of life. Some of us, though, will experience the deterioration of the centralized portion of our eye and become visually impaired. 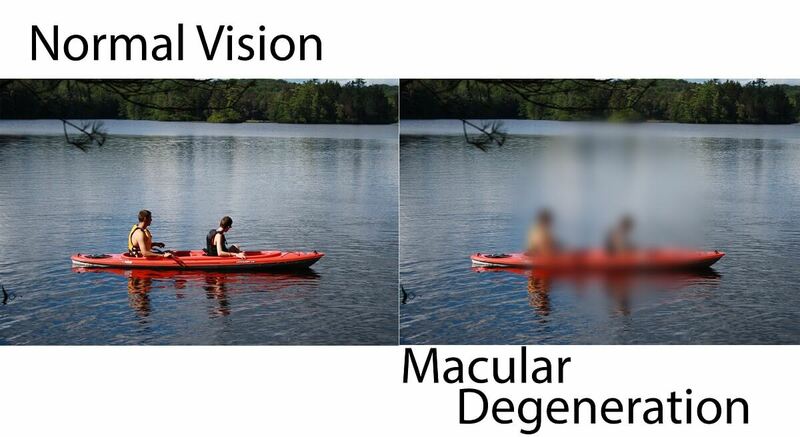 Research suggests that certain types of genetic components can cause macular degeneration. It also suggests that the oxygen-deprived cells in the retina produce a certain type of protein called vascular endothelial growth factor, which triggers new growth of blood vessels in the retina. Since this is a progressive disorder, receiving regular eye exams are extremely important for individuals over 50. Although macular degeneration is a slow and gradual disorder, there are precautionary measures you can take to detect the early stages of it. The first step is to visit an optometrist, which CABVI has two on site! They will inspect your eyes for any yellow deposits under the retina and any pigment changes within your eye, which are clear signs of macular degeneration. If you fear the doctor, there is a test you can conduct yourself at home. Utilizing a graph pattern comprised of black lines, you can determine if there is distortion, blurriness, or black spots within the center of the graph. If there is, put your fear aside and come see us! We cannot stop aging (bummer, right? ), but we can make a few healthy changes to prevent the disease from developing. Smoking, along with obesity and inactivity, is a major risk factor for the disorder. All three have the ability to expedite macular degeneration, and research has shown that individuals who fall into these categories had double the risk compared to people of normal body weight and non-smokers. Associated with obesity, inactivity, and smoking is high blood pressure, which is another factor that can speed up the process of macular degeneration. Macular degeneration does not have a cure, but if you follow a healthy lifestyle and protect your eyes from ultraviolet light, you will have a drastically reduced chance of developing the disease.